Dylan O'Brien's 'Thomas' and all the other Glade survivors are back to run another day in Maze Runner: The Scorch Trails. 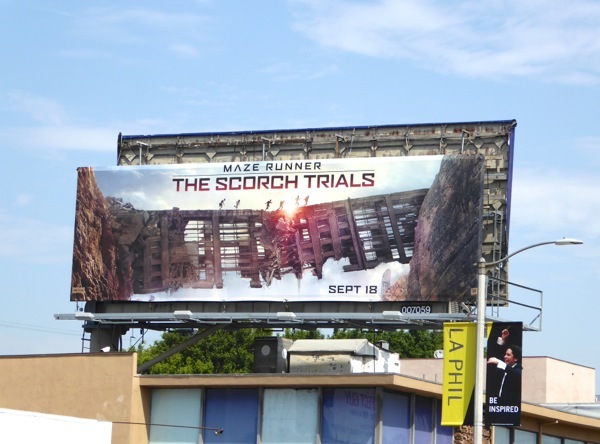 In last year's adaptation of James Dashner's 2009 young adult book of the same name, The Maze Runner, the memory-wiped male teenage inhabitants escaped the deadly labyrinth and the lethal Griever creatures to discover the truth about their post-apocalyptic dystopian world (or a version of the truth at least). 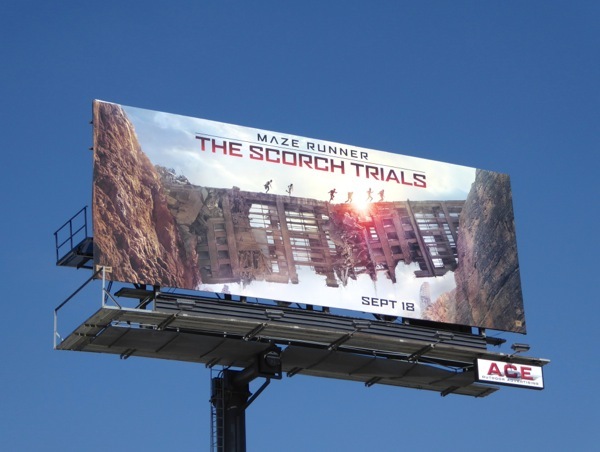 Now outside the maze, the Gladers must survive the next stage of the WCKD organization's experiments and face the perils of the desolate Scorch, a ruined world filled with unimaginable obstacles, in the latest in their twisted trials. 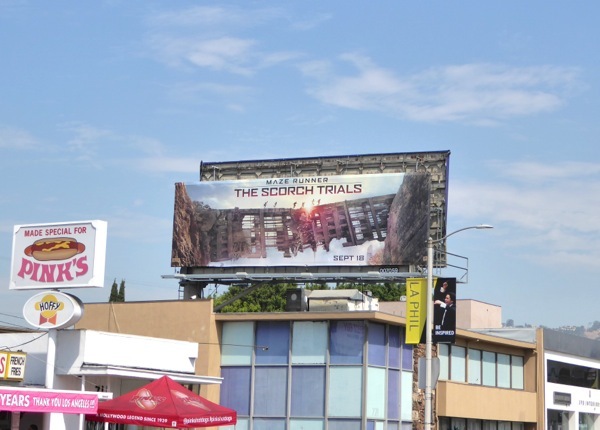 The first film installment didn't receive much support in the way of outdoor ads, so it's nice to see this smattering of billboards around L.A. for the sequel, and the imagery certainly hints at the scope and awesome danger they will face in the Scorch. 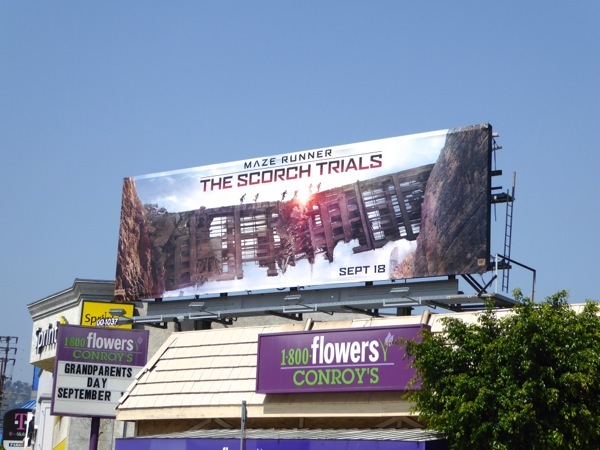 These cool billboards were first spied along La Brea Avenue on August 19, then later along La Cienega Boulevard and the Sunset Strip on August 23, 2015. 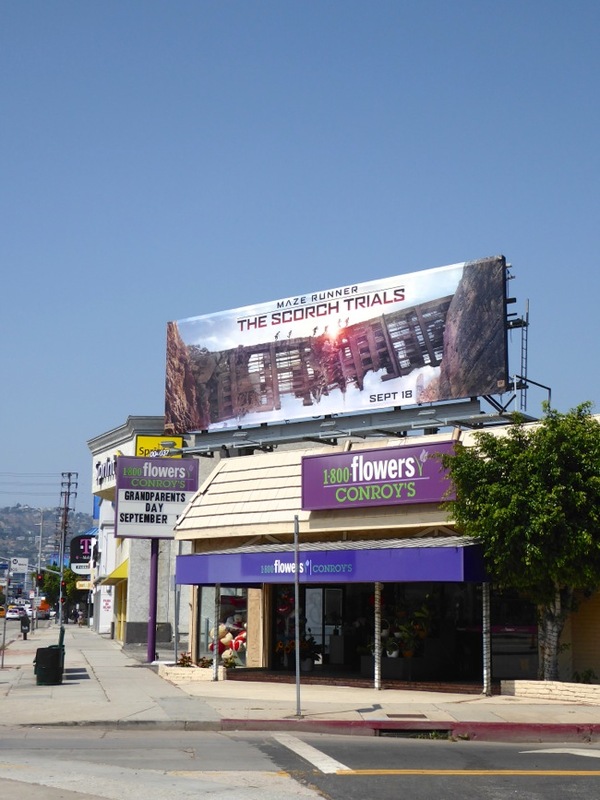 If you're a fan of Dylan O'Brien, be sure to also check out these Teen Wolf MTV billboards from recent years. And as these movies are based on a trilogy, the franchise is sure to keep on running until the next installment set to be released in 2017, Maze Runner: The Death Cure (unless this one falls off a cliff, or the side of a building, and bombs of course).